The City Council on Thursday unanimously approved an incentives package worth $3.3 million for the five-story Museum Reach Lofts, a 94-unit development on the southeast corner of North St. Mary’s Street and West Jones Avenue, where rents will start at $290 for low-income individuals. The development is considered a unicorn among the dozens of apartment buildings that have gone up in and around downtown the past six years. The new housing, spurred by a downtown incentives policy that’s currently on hold, is composed mostly of market-rate and luxury apartments. Downtown has seen some apartments built for people making less than the median wage—the city estimates there have been 1,544 of these types of units produced since 2012—but many of those are just a level below the median figure, and therefore they’re not considered truly affordable by many housing observers and Council members. 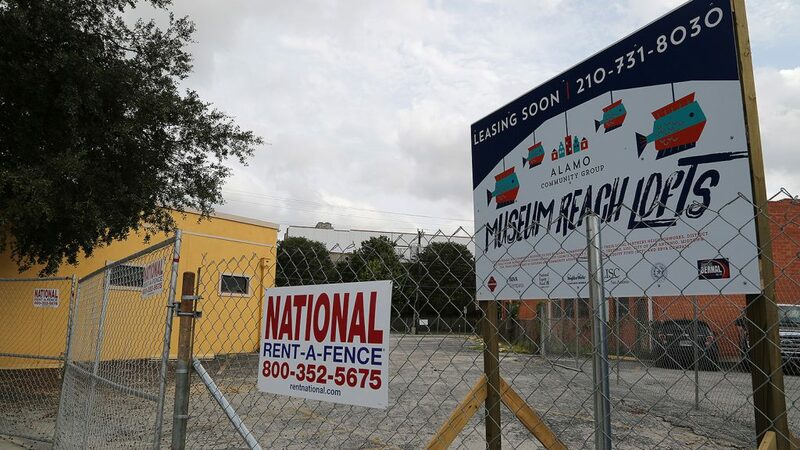 The $17.5 million Museum Reach Lofts project, which is being developed by the nonprofit Alamo Community Group, will provide 86 of the 94 apartments to people making between 30 percent and 60 percent of the area median income (AMI), which translates to between $20,400 and $40,800 for families of four, according to the U.S. Department of Housing and Urban Development. For Alamo Community Group, which also owns the Calcasieu Apartments on Broadway, it was about adding true workforce housing in an area of downtown that’s seeing an influx of employers such as Credit Human and Jefferson Bank, both of which are moving their headquarters to Broadway. In accordance with the SA Tomorrow Comprehensive Plan process, Alamo Community Group (ACG) saw the need for more workforce housing in Midtown, one of 13 nodes the plan identifies. Gonzalez pointed to the procurement of 9 percent housing tax credits as the main reason the rents at Museum Reach Lofts will be offered at such low prices. This year, the lofts won $1.2 million in tax credits—a federal program that’s administered by the Texas Department of Housing and Community Affairs (TDHCA). Gonzalez estimates the project will gain $10 million in equity after the tax credits are sold to investors, which amounts to 57 percent of the project’s total budget. That was the main driver of lower rents. But other incentives played a role. City officials and developers describe the high cost of downtown land as the largest obstacle in building any housing at any price point, much less affordable. For the Museum Reach Lofts, ACG is now receiving a reimbursement grant up to $2.8 million from the Midtown Tax Increment Reinvestment Zone (TIRZ) for the purchase of the 0.63-acre land. In a TIRZ, the revenue gained from the rise in property taxes is reinvested into projects within the zone. Two weeks ago, the Council debated a TIRZ incentive for the upcoming 283-unit Broadway Jones apartments, although that award will pay for utility work. The project drew criticism for its lack of true affordability—most notable District 4 Councilman Rey Saldaña and District 9 Councilman John Courage, who voted against the incentive. With the Museum Reach Lofts, the Council rhapsodized about the project, which is also receiving a forgivable Chapter 380 economic development loan up to $564,000 for work related to underground utilities. Under the old Center City Housing Incentives Policy (CCHIP), it’s receiving city and SAWS impact fee waivers, and ACG has also seeking a tax rebate, said Assistant City Manager Lori Houston. The tax rebate on city property taxes is on hold as city officials and the Council hammer out revisions to CCHIP. In past interviews, Gonzalez said the cost of construction, of land, and other factors aren’t discounted to nonprofit developers such as ACG just because their purpose for building is altruistic. Layers of incentives are needed to be able to offer affordable rents—i.e., make up the difference lost by offering lower-priced rents. “It’s kind of that lasagna we have to make that helps us drive down that rent,” Gonzalez told the Council. However, perhaps the most important layer—the 9 percent low-income housing tax credit—may not be available for a downtown multifamily project again. Each year, the TDHCA doles out the tax credits to a handful of developments in different regions of the state. It doesn’t award tax credits to a project within two miles of a project that has already received the award. That would rule out most of downtown. Construction on the Museum Reach Lofts is expected to start March, and be complete in September.